The 5th of April 2019 marks the annual Qingming Festival 清明節, when departed loved ones are remembered and forebears are respectfully celebrated. The Qingming Festival of 2019 offers a moment to recall some of the great figures of the Chinese past who protested against misguided politics, injustice and popular folly. A few days before this Qingming, the writer Tao Haisu 陶海粟 circulated online three poems in the classical style to express his support for Xu Zhangrun 許章潤 of Tsinghua University. Below, following a short introductory essay on protest and poetry in the People’s Republic, we reproduce Tao’s poetic trinity and offer draft translations with some rudimentary notes that may help readers better understand both their humour and their significance. These poems evoke a Muse with split loyalties: both to traditional verse as well as to the more humorous tradition of doggerel rhyme 打油詩 dǎyóu shī, itself a venerable and more light-hearted poetic strain the origins of which can be traced back to the Tang dynasty. From my late twenties, I frequently acted as a ‘poetry mule’ when Yang Xianyi 楊憲益, Huang Miaozi 黃苗子, Wu Zuguang 吳祖光, and sometimes other aficionados from the old Layabouts’ Lodge 二流堂, exchanged doggerel verse that made light of the portentous events of the day. No one had ready access to a telephone and, although the Beijing postal service was efficient, my elders enjoyed having an eager, bike-riding ‘foreign friend’ hand deliver their slightly subversive four-liners in person, collect updates and deliver good-humoured ripostes. It was part of an ancient tradition among men and women of letters; it was also, in more ways than one, an education. 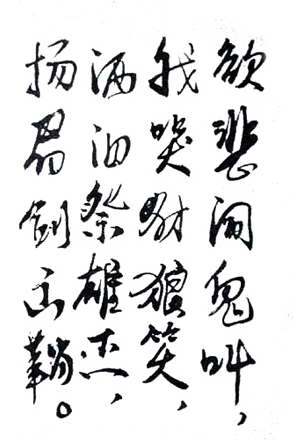 Here we would note that the Letter of Support composed by graduates of Tsinghua University and translated in our series ‘Xu Zhangrun vs. Tsinghua University’ (see ‘Speaking Up for a Man Who Dared to Speak Out’, China Heritage, 1 April, 2019) quotes the most famous line in an encomium that Chen Yinque 陳寅恪 wrote for Wang Guowei 王國維 in 1930 where Chen praised Wang for being possessed of ‘A Spirit Unfettered and a Mind Independent’ 獨立之精神, 自由之思想. This is also used by Guo Yuhua in the conclusion to the essay she wrote in support of Xu (see Guo Yuhua 郭於華, ‘J’accuse, Tsinghua University!’, China Heritage, 27 March 2019). Wang was one of the last great scholars of classical Chinese poetry, in particular the ci-lyric 詞 and, decades later, it would turn out that Chen Yinque employed his mastery of classical verse to comment on the Mao era. In a breathtaking work of scholarship Yu Yingshi 余英時 analysed the poems Chen wrote before his death in October 1969, revealing the blind historian’s undaunted spirit. As a result of Yu’s forensic analysis, it was revealed that Chen had chosen the most powerful Chinese literary form to reject Mao, his comrades and their deadly enterprise. Hu Qiaomu, the Party ideologue whose machinations have often featured in China Heritage was aghast at this development. Thinking of himself as a ‘friend of prominent intellectuals’, and believing that a few hours of conversation with Chen Yinque decades earlier gave him some privileged insight into the psychology of the great scholar, Hu organised a Hong Kong-based denunciation of Yu Yingshi’s findings. The results were clumsy, but in keeping with in the trademark style of Party propaganda, and Yu made a point of joking about the episode in his introduction to the second edition of the book he devoted to his study of Chen’s late poetry. 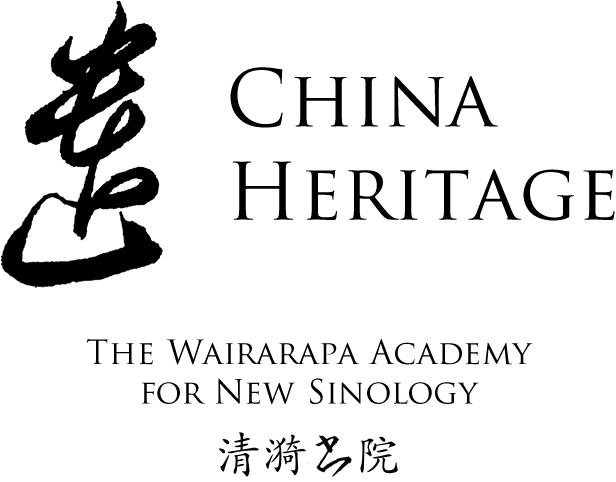 This is the latest in our series of Lessons in New Sinology. These are works both that offer the general reader some insight into a certain aspect of contemporary China, while also providing students and scholars who are interested in the complex interconnection between that country’s politics, culture, history and thought annotated material that highlights vital aspects of how traditions persist, are re-invented and flourish in new ways. My thanks to Warren Sun 孫萬國, a dear friend who has a profound understanding of Chinese politics, letters and history, for his suggestions. On Qingming each year, it is all too often the case in the People’s Republic of China, that families not only remember their ancestors and forbears, they also grieve anew over loved ones who died in one of the numerous deadly political campaigns launched by the Communist Party since 1949. On Qingming 2019, as the media reverentially reported that Xi Jinping, the ‘People’s Leader’, was lavishly extolled for remembering Party martyrs, families whose loved ones were killed by the People’s Liberation Army and the authorities on the 4th of June 1989 or during the subsequent crackdown in Beijing and other Chinese cities had no choice but to mourn in secret. Members of Falungong also remembered the coreligionists who have died since the 1999 purge of their sect. Loyal Party members and soldiers are commemorated by the state on Qingming and the new official Martyr’s Festival 烈士節 for, long after their service and sacrifice in life, in death they have no choice but to maintain their contribution to the Party’s cause forever. Qingming also marks a significant day when mourners gathered en masse to protest against Party autocracy. A famous Qingming poem of the late-Mao era. Premier Zhou Enlai had died in January . On April 5, China’s traditional festival for cleaning graves, two hundred thousand people demonstrated in Beijing’s Tiananmen Square. Ostensibly mourning Zhou Enlai, the demonstrators were in fact protesting the power of Jiang Qing and her associates. When the crowd refused to disperse at the end of the day, the scene grew ugly — a mob smashed several vehicles and burned a police command post. At night, militia and public security forces, under the control of Hua Guofeng, cleared the square [according to Warren Sun, later testimony and research indicates that, in fact, Hua ‘did not have blood on his hands’ and others were culpable for the murders. — Ed.]. Many demonstrators were beaten — others were arrested. The following morning, the Party Political Bureau declared the incident to be ‘counterrevolutionary’ and removed Deng Xiaoping from all offices as its ultimate instigator. At the same time Hua Guofeng was appointed premier and vice-chairman of the Party. But after Mao died in September and the ‘Gang of Four’ was arrested in October, China’s politics moved slowly but steadily to the right. As figures disgraced during the Cultural Revolution regained respectability and influence, support for Deng Xiaoping mounted… . Deng Xiaoping’s victory in this struggle was tied to the Party’s judgment of the 1976 Tiananmen incident. Deng pressed relentlessly for a reversal of the Party’s verdict, arguing that the demonstration in fact had been ‘revolutionary’. By implication, anyone involved in its suppression had committed a grave error. A reversal would be a fatal blow to the authority of Hua Guofeng, former minister of public security. Many of the 1976 demonstrators had written poems that they posted in Tiananmen Square. Students from Beijing’s Number Two Foreign Language Institute, a school with close ties to Deng Xiaoping, edited over one thousand of these poems and published them in four unofficial mimeographed editions. These began to circulate shortly after the fall of the ‘Gang of Four’, constituting an open provocation to Hua Guofeng. Police from the public security forces searched for some of the pseudonymous or anonymous authors, but not very effectively. In some cases the police revealed the poets’ identities not to Hua Guofeng but to the student editors. I weep while wolves and jackals laugh. With head raised high, I draw my sword. In November 1978, Beijing audiences flocked to ‘Where Silence Reigns’ 於無聲處, a play first staged in Shanghai that addressed the question of the repression of the ‘Tiananmen Incident’ two years earlier. Over a number days in early April 1976, crowds had gathered in Tiananmen Square to mourn the recently dead Premier Zhou Enlai, and to protest against Mao and his radical supporters. By 1978, the protests were seen in a new light and China itself was undergoing a profound political and economic realignment. The title of the play — ‘Where Silence Reigns’ — was inspired by a line in a classical Chinese poem by the country’s most famous modern writer, Lu Xun (魯迅, 1881-1936). The last line of the untitled poem 無題, dated 30 May 1934, read 於無聲處聽驚雷, literally, ‘A startling clap of thunder is heard where silence reigns’. In other words: ‘a sudden sound breaks through the oppressive atmosphere’. Lu Xun’s poem was a terse reflection of the seemingly hopeless state of China at the time but the famous last line extolled the promise of unexpected protest. Decades later, both Mao and his enemies — in particular disillusioned Red Guards — would quote the poem to affirm their claims about rebellion against repression and their hopes for a better future. ‘Where Silence Reigns’ was staged at a momentous time in China’s modern history, a period that was remembered and commemorated in many ways forty years later in November-December 2018. Mao was dead, his radical revolutionary supporters had been arrested or sidelined, essential reforms of education and science were unfolding, men and women who had for decades been jailed, exiled or who were still living in the shadows were being exonerated, and the long-stagnant intellectual and cultural life of the country were going through something of a ‘Beijing Spring’. The Party, the leaders of which were mired in the blood and violence of their misrule, was desperate to regain a measure of legitimacy and to do so quickly. It rejected two decades of a destructive policy that favoured pitiless class struggle and universal ideological repression, and turned its focus to rebuilding a crippled economy and improving the livelihoods of a people that it had cruelly betrayed. Silence or voicelessness, 無聲 wúshēng, was a theme of Lu Xun’s work, just as speaking out and being heard have been paramount concerns for Chinese men and women of conscience for the last forty years (as well as, when possible, the thirty years before that). In late July 2018, Xu Zhangrun (許章潤, 1962-), a professor of law at Tsinghua University in Beijing and a research fellow with the Unirule Institute of Economics, broke the silence that has spread under the draconian rule of Xi Jinping, the supreme party-state-army leader of the People’s Republic. In an eloquent and withering essay Professor Xu expressed his concerns about the state of Chinese politics and anxiety about the country’s future. (See Xu Zhangrun, ‘Imminent Fears, Immediate Hopes — a Beijing Jeremiad’ 我們當下的恐懼與期待, China Heritage, 1 August 2018). Among other things, Xu’s essay warned against the revived spirit of Qin Shihuang, the despotic First Emperor of the Qin dynasty who was so admired by Mao. consigned to the flute of poetry. ‘Another Repentance’ was written by Gong Zizhen (龔自珍, 1892-1841) in 1839. Frustrated with bureaucratic life and as a result of his failure to find support for his ideas, Gong quit officialdom and returned to his native home. The poems he wrote at the time reflect his frustrations and are one of the last expressions of cultural exasperation by a significant man of letters prior to a military conflagration that contributed significantly to the profound changes the Chinese Qing Empire was experiencing. It was the eve of the First Opium War, a conflict between the Qing and the expansive Western trading powers of Great Britain and France. In the aftermath of defeat, China would enter what some would call its ‘long nineteenth century’, one that the Communist Party claims only ended with the establishment of the People’s Republic of China in 1949. For others, like Professor Xu Zhangrun 許章潤 of Tsinghua University, the long nineteenth century was one during which the Qing Empire not only suffered repeated military and domestic humiliations but also launched a vast enterprise of change. After more than one-hundred and fifty years that modernising transformation of the nation is far from over. In a series of polemical essays, starting with an appeal in 2016 to preserve the policies of economic transformation and relative openness that underpinned the nation’s life from 1978, Xu Zhangrun became increasingly vocal, and more pointed, in his protests against the political and economic changes that were taking place under the rule of Xi Jinping, Wang Qishan and their Politburo colleagues. When Xi was granted the equivalent of ‘terminal tenure’ as China’s leader in March 2018, a widespread concern in the nation found voluble expression in Xu’s now-famous Jeremiad, ‘Imminent Fears, Immediate Hopes’ 我們當下的恐懼與期待 (translated in China Heritage, 1 August 2018). In such writing what paltry profit would one seek? One decent man’s steely resolve does go against that tide. While Letian’s ballad would chide an emperor. All down the ages would mourn the loss. Heart-breaking, then, that countless steeds fall quiet. In vain was the Lord of Heaven’s gift of talents. My works I write merely to eke out a meagre living. Some one who utters their compliance before a task is assigned. Constantly examining their master’s countenance to gauge their wishes. The Master said: “Man can enlarge the Way. 杜口 dù kǒu: ‘to block mouths’, ‘to stuff a mouth so it remains silent.’ Feeling constrained to keep quiet 噤聲 jìn shēng or to have one’s mouth shut 鉗口 qián kǒu, are like a threnody that reverberates through Xu Zhangrun’s works translated in China Heritage (see The Xu Archive). are silent now, their mouths shut tight. In August 2018, I dedicated my translation of Xu Zhangrun’s essay ‘Imminent Fears, Immediate Hopes’ 我們當下的恐懼與期待 to the memory of Wu Zuguang. He was an outspoken man of principle who, even in the darkling years after 4 June 1989, never abandoned his independent critical stance.